Kevin graduated from the University of Sydney in 1995 and commenced his career as a physiotherapist for the Australian Defence Force (ADF) in the Australian Army. During this time Kevin was awarded an Australian Active Service Medal and became the highest ranking and most decorated physiotherapist in the ADF. The highlight of his career was as the chief physiotherapist in East Timor with INTERFET in 1999-2000. After moving to Albury in 2001, Kevin joined Flex Out Physiotherapy and became the sole principal in 2002. 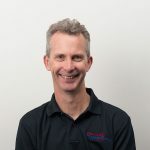 During this time Kevin has successfully steered Flex Out Physiotherapy from a one-person vision, to a multi-clinic organisation with ten clinics across four states. Kevin’s philosophy of long consultation times, one-on-one interactions and a focus on ‘hands-on’ manual therapy techniques has been fundamentally important in the success of the business over the past 20+ years. Kevin has worked with many Australian teams including Athletics Australia, Volleyball Australia, Rowing Australia and Triathlon Australia. He is also dry needling accredited and has a special interest in sports physiotherapy, occupational health physiotherapy and lower limb injuries.